This research study was to create an understanding on the topics learnt in the class and check my ability to relate, analyse and evaluate those understandings to more rational platform from an economical perspective. The New Zealand government is involvement in its local economy through its objectives to develop and deal with issues relating to economic growth, price stability, full employment, fair income distribution and maintain a balance of payments in its economy. The government’s role is to control those economic activities and interactions between the individuals and the firms who are involved in business performance with each other .Some of these directives are through general guidelines and policies, like the laws, which brings people together to the same platforms who wish to operate business in the community implemented by the judicial systems of the New Zealand government. Inflation comes in flat- official cash rate (OCR) tipped to stay low. Expectation- interest rate to stay lower. Inflation was steady in New Zealand for third quarter of the year. Housing and household utilities in Auckland and in Christchurch went up by one percent from annual increase of 3.4%. Price inflation was major concern for reserve bank of New Zealand. This article is related to price stability under government objectives and trade-offs. Price stability is where in an economy the price either changes slowly or do not change at all. Employment and inflation are major factors affecting price stability. 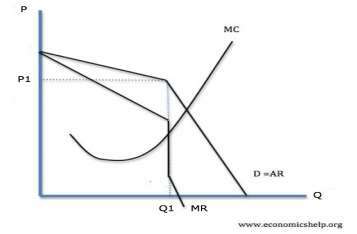 This price stability theory simply means if there is increase in annual price or interest, this would lead to fall in revenue. The implications of the article for the New Zealand economy and on the individual is that price stability leads to decrease in annual price so that New Zealand can gain market share, so other business people or firms also decrease prices so that they don’t lose market share. Price stability is common in oligopolistic markets. The graph above shows and suggests that price will be stable. The price doesn’t increase there will be sharp fall in demand. Lower prices lead to lower revenue. Trade me jobs led to 41% roles in construction and architecture, 40% up for property and 29% up for agriculture. (Growth nationwide in three strongest areas). Seek New Zealand- Bulk of new jobs ads nationwide compared to last year). This article is related to full employment under government objectives and trade-offs. Full employment is the percentage level of employment rates without any recurring or any short demand of unemployment rate in an economy it is where people are willing to work and happy with the current wage rate which means there is low demand of unemployment. In full employment capital and labour resources are meant to be fully utilized. The implications of the article for the New Zealand economy and on the individual is that full employment leads to low demand of unemployment and a massive growth is expected in New Zealand’s farming industry by next year of jobs adding up to 83% in nationwide. Full employment would improve standard of living of people in economy as it will alleviate poverty. Which means many people would be able to afford for the goods and services resulting in an increase in their spending in the economy and increase on GST payments to the government of New Zealand. Therefore it can be said that increase in employment will benefit New Zealand while taking consider to the economy’s balance of payment, interest rate which has a direct and massive impact on New Zealand’s foreign investments and trades off. More holiday destinations due to work reserved. Driving across construction- safety is needed of drivers and contractors. This article is related to fiscal policy. It is government spending and the taxes used to inspire the economy and influence aggregate demand and the level of economic activity in various sectors. Fiscal policy can be used to stabilize New Zealand’s economy. The implications of the article for the New Zealand economy and on the individual is that macroeconomics variables can be affected. The level of economic commotion, Reserves and Investment in the economy, the circulation of income is affected mostly on government spending and taxes. This fiscal theory can also lead to employment. Simply fiscal policy aims for growth in New Zealand’s economy, avoids ups and downs in economic cycle and keeps inflation low. NZ dollar jumps vs. pound after bank of England low inflation waning. Inflation could fall below 1% over six months. New Zealand dollar advances affected its trading partners. Overseas banks say interest rates are not likely to rise anytime soon. This article is related to monetary policy. Monetary policy theory defines it as a strategy taken by the nation’s Reserve Banks or the Central Bank, or any other allocated financial institution of a country to controls and maintain their supply and the availability of money or finance in its economy, together with what the interest rates to be established in order to accomplish its set of objectives outlined towards growth and stability of its economy. The implications of the article for the New Zealand economy and on the individual is that it would affect overseas trading partners. Before overseas shareholders can finance in New Zealand, they must exchange their foreign currency into New Zealand dollars. This increase in demand for New Zealand dollars will cause the New Zealand dollar to rise. (monetary policy, 2014). The level of the employment rate would increase due to the demand of the New Zealand manufactured or supplied goods and services. The aggregated supply of money is depicted by the monetary policy. It is the contributing factor in influencing the outcomes for the economy such as its economic growth, its market price inflations or deflations, its foreign exchange rates in relations with other countries currencies’ which has a significant impact on its balance of payments. Do you support NZ’s involvement in the TPP agreement? (NzHearld, 2014). A group protested against TTP against New Zealand being in foreign investment. This article is related to free trade theory. It is a policy where government do not restrict imports or exports in international markets. This article relates to the boost created by a significant increase in the New Zealand’s export sector majorly contributed by the dairy sector of the nation resulting in an increase in the terms of trade for New Zealand which means an increase in the purchasing power of New Zealand’s export to other foreign nations. The implications of the article for the New Zealand economy and on the individual is that a rise in the export prices compared to the import prices allows a more quantities of imported goods and services to be purchased with a specified quantity of exported goods and service to foreign nations, An increase in New Zealand’s terms of trade means that now New Zealand can buy more imports for the same amount of exports and hence would address its current account where a significant deficit in the balance of payment. The advantages and disadvantages of moving towards free trade can become the purchasing power of the New Zealand has a direct impact on the nation’s economy growth where the income generated through the local produce exportation could be utilized into other ventures such as foreign investments and importing more capital goods which in return are utilized to produce more consumer goods. Hence creating an economy growth by increasing the employment rate, improving the living standards of the individual and creating a boost in the nation’s export market. Flat trading between New Zealand and Australia- most profitable markets. Impact on cash flow and dept. Cash flow fell which led to net dept. increased. This article relates to the New Zealand government’s Balance of Payment policy.The Balance of payment accounts as the summary of the economic transactions of the New Zealand government with other countries consisting of two types of accounts. A current account is made up of New Zealand’s foreign liabilities economic theory. The implications of the article for the New Zealand economy and on the individual is that New Zealand is facing a significant imbalance in payments its current account where its import rate is higher than what it is exporting. In other words it is it is paying more money for its imported goods and services than it is generating through its exports resulting in a trade deficit crises. Trade deficit results when more money goes out of a country than what is being injected into the economy. New Zealand’s trading deficit concludes that it is not utilizing its local resources which are land, labour, capital and its entrepreneurship into the most effective and efficient manner. Therefore, it needs to look for ways or introduce new methods and techniques for utilizing its raw materials and resources in an effective and efficient. Kiwis selling their product overseas will become easier. In order to do business there is no need to build offshore branches for entrepreneurs and innovators. This would let New Zealand to compete with other trading partners. This article relates to the relationship between foreign exchange and imports and export under foreign exchange market. The price of one currency in terms of another is known as exchange rate. Trade deficit occurs when exports are less than imports. The implications of the article for the New Zealand economy and on the individual is that having a bigger market scale to sell their produce to simply mean that a business would sell more and create larger profits for themselves enabling them to allocate higher wages to their employees and who in return are in a greater position to spend their money in local economy. New Zealand would experience a rise in the living standards of its citizens with an, increased real incomes resulting in a higher rates of economic growth. This would be created by a more competitions in local and foreign markets and an increase in the productivity level. New Zealand can extremely benefit by its memberships in The Trans-pacific partnership negotiations where it can boost its export market while addressing to its current balance of payments deficits by creating more jobs, increasing its level of production and allocating its local resources in a more efficient and effective manner and thus creating a boost to its economic growth. "New Zealand’s Involvement with Free Trade." UKEssays.com. 11 2018. All Answers Ltd. 04 2019 <https://www.ukessays.com/essays/economics/zealands-involvement-free-trade-9320.php?vref=1>. "New Zealand’s Involvement with Free Trade." All Answers Ltd. ukessays.com, November 2018. Web. 23 April 2019. <https://www.ukessays.com/essays/economics/zealands-involvement-free-trade-9320.php?vref=1>. UKEssays. November 2018. New Zealand’s Involvement with Free Trade. [online]. Available from: https://www.ukessays.com/essays/economics/zealands-involvement-free-trade-9320.php?vref=1 [Accessed 23 April 2019]. UKEssays. New Zealand’s Involvement with Free Trade [Internet]. November 2018. [Accessed 23 April 2019]; Available from: https://www.ukessays.com/essays/economics/zealands-involvement-free-trade-9320.php?vref=1.